WASHINGTON — President Barack Obama on Wednesday told residents of Florida and other states along the path of Hurricane Matthew take the threat seriously. Government officials are worried about complacency, especially in South Florida, which hasn’t seen a major hurricane in 11 years. 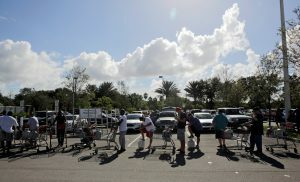 Obama said the hurricane will be building in strength as it makes its way to Florida. Even if states don’t see the full force of the hurricane, there is still the potential for devastating effects from tropical force winds and storm surge. Obama received a briefing at the Federal Emergency Management Agency’s headquarters. Some of the officials in attendance included Homeland Security Secretary Jeh Johnson and Craig Fugate, the administrator for FEMA. FEMA has deployed personnel to emergency operation centers in Florida, Georgia, South Carolina and North Carolina. It’s also positioning commodities and other supplies at Fort Bragg in North Carolina and in Albany, Georgia. “We hope for the best but we want to prepare for the worst,” Obama said. Obama also asked Americans to remember that Haiti, one of the poorest nations in the world, has been hit hard by the hurricane. He asked them to visit the website for the Center for International Disaster Information — cidi.org — to learn how to help.